Chin Up. Lisa Sandall’s Amazing Furniture. 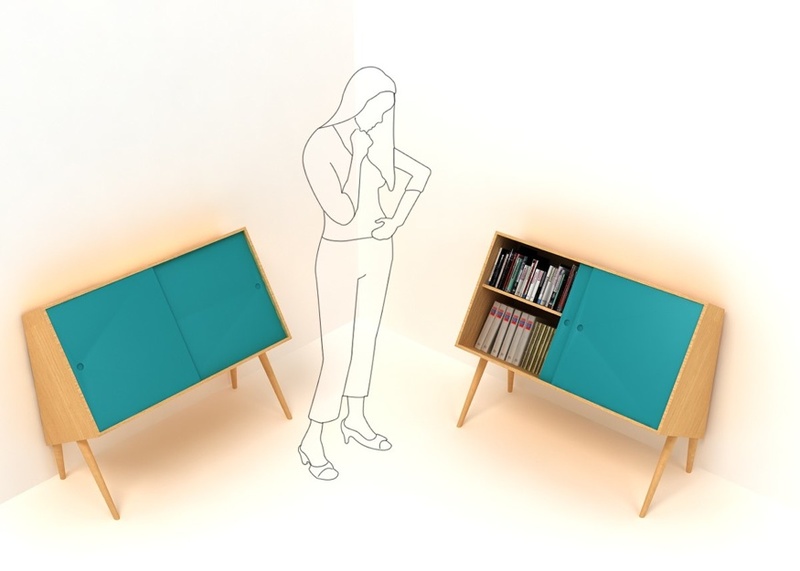 United Kingdom based furniture and product designer Lisa Sandall has created a number of wonderful furniture pieces in the last year.A recent graduate from Nottingham University, she has enhanced her education with a series of internships in Milan and Barcelona and it shows. Her work is so solid and well thought out. What caught my eye this morning was the “Chin Up” book-case. Clean simple lines, functional, innovative and clever. I tried to get more information on the materials used in the Chin Up bookcase but came up short. From the photos it looks as though the case is made from cherry, and the doors are probably painted plywood. It doesn’t really matter because this is a show stopper piece of design. 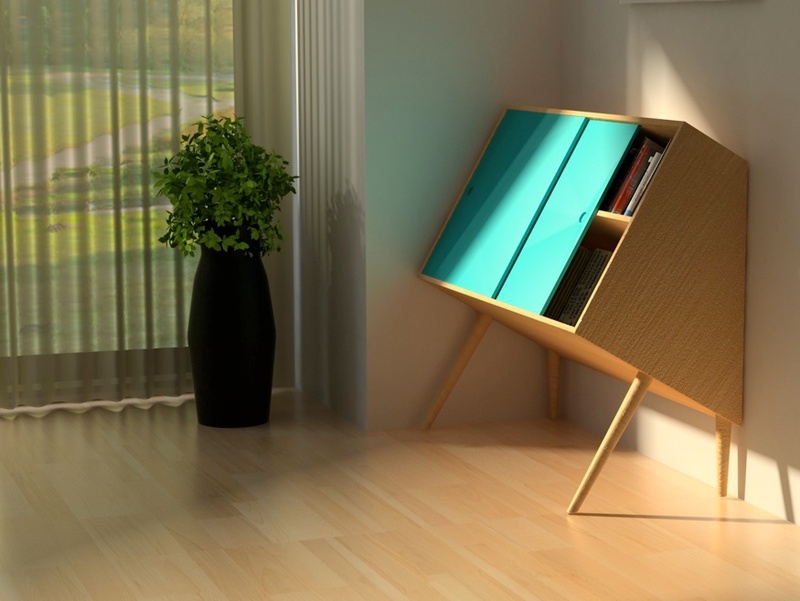 The design allows you to bend and kneel less when placing and removing books from the shelves. So simple, and yet genius. Sandall’s other works include the “Alfie” lamp. 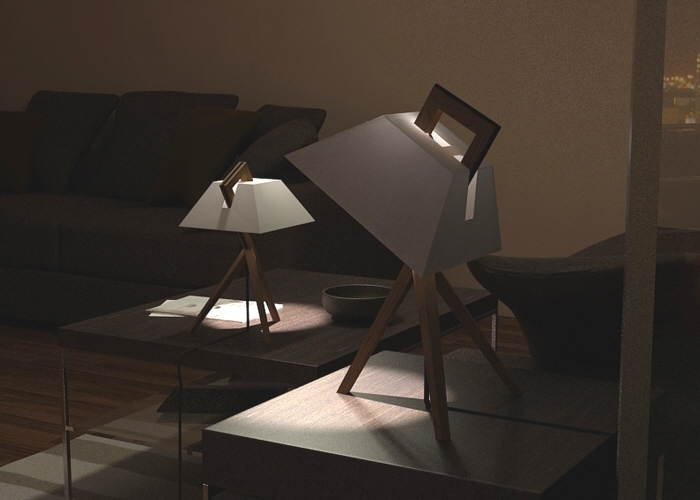 The Lamp is illuminated by energy-efficient LED’s and once again takes simplicity to a new level. 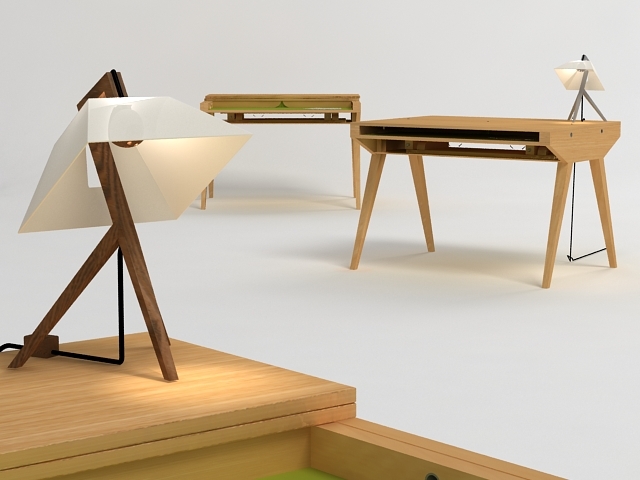 I love the fact that the frame becomes a handle for moving and positioning the lamp, and that the shade tilts to allow you to direct the light. There is an elegance to the shape and form the lamp creates, that reminds me of a Japanese pagoda lantern. 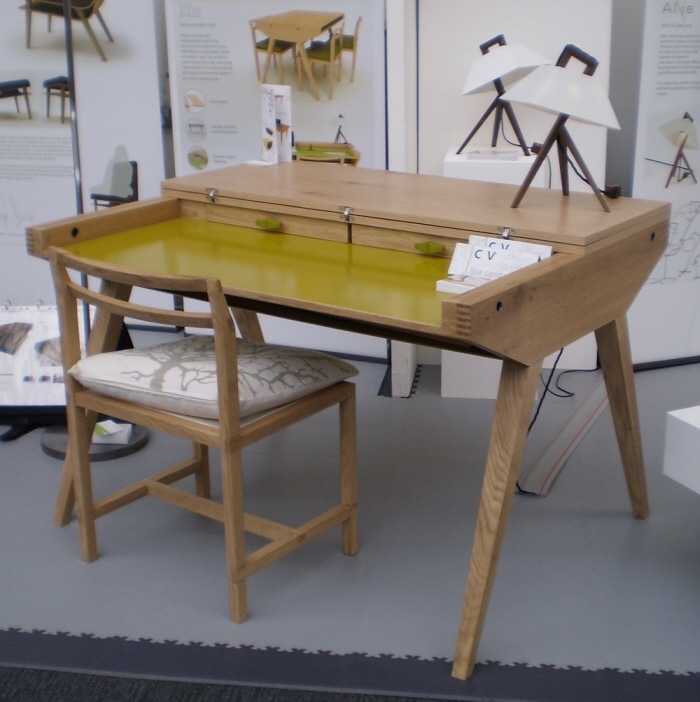 The “Will Dining Table/Desk” is another example of her amazing furniture design skills. 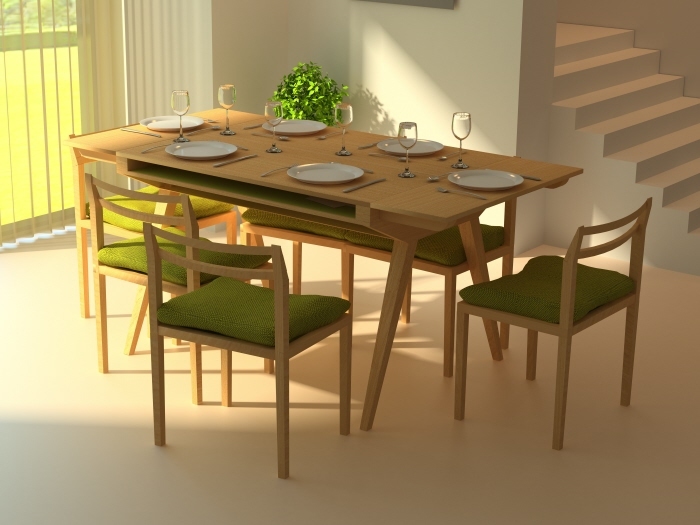 A small 4 seat dining table that can be used as a desk. Perfect for smaller spaces or an apartment. The table looks heavy when closed. A solid sturdy structure with recessed openings just below the surface. 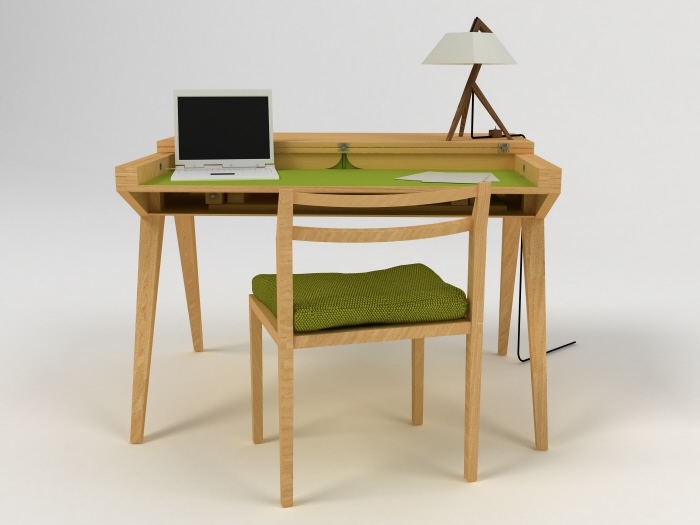 When the table top is folded up, it reveals the desk working surface, which also contains two small drawers. I love the structure of this table. The heavy trestle, or roof truss look, and the light almost delicate interior of the desk. The chairs are a well thought out compliment that completes the set. I think the thing that really Lisa Sandall has here, the thing that helps her stand out is the attention to detail in her work. From the choice of materials, to the hardware used, to color pallets. Really nice stuff. More images of her work below. ← Design Friday, Ray Gun Magazine.